Good sound separation for surround effects. Good build quality, all connections are solid and secure. 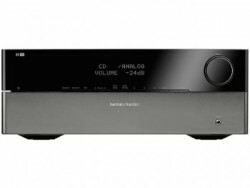 The Harman/Kardon AVR 745 is a 7.2-Channel A/V Receiver with HDMI switching and Audio and video processing. It has a Stereo mode power of 100W per channel, and Multichannel power of 85W x 7 Channels. By design, Revel Concerta™ Series loudspeakers offer outstanding value. But you can be assured that they’ve been developed with the same stringent attention to musical honesty and engineering precision that are the hallmarks of every Revel system.